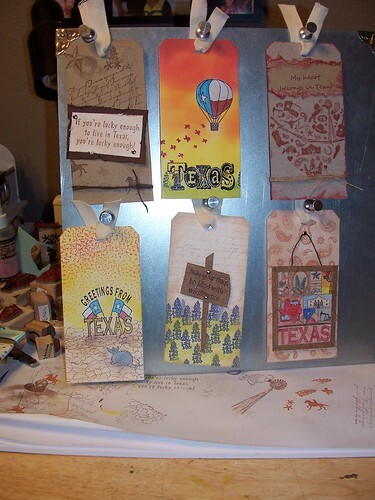 I have been hounded for sometime to have a 6 Tags of Texas class at Felicia's pretty much ever since she received samples from Deadbeat Designs. You can go to their blog and find links to the far-better-than-mine tags created by Mark. Of course I didn't want to just copy his tags (as awesome as they are) mostly because he did a lot of really time consuming techniques and because they wouldn't be my Tags of Texas. The first tag is a collage tag. I stamped several Deadbeat Designs stamps all over the card. For some of the larger images I stamped off first and used the second generation stamp to soften it up a bit. I also used the crackle stamp all over the background. It is very light and subtle (doesn't show up well in the picture) but it adds some great texture to the tag. My second tag was created by sponging ink in layers to mimic a sunset. I am totally smitten with this Texas balloon so it has front and center billing. 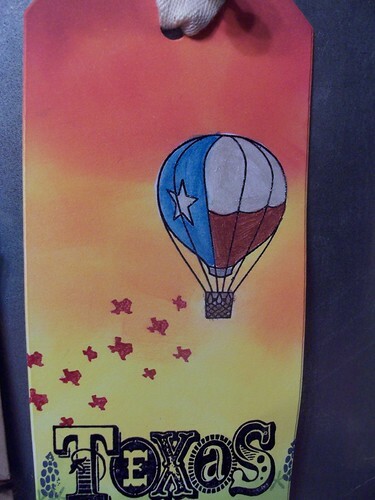 I colored the balloon and the ornate Texas with shimmering water colors. 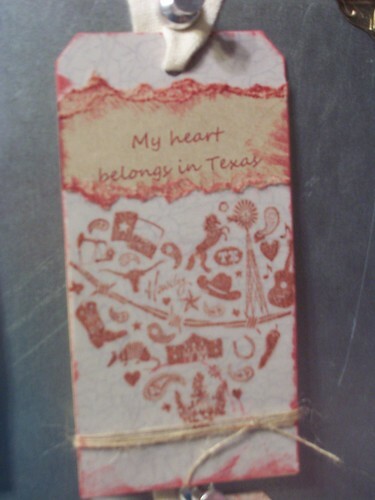 The third tag has a piece of vellum stamped with the large Texas heart. I really wanted to use my new Deadbeat alphabet but it was just too big for these tags (and my sentiment). I have another 6 tags in the trash to prove it. The vellum tag is on top of a kraft tag stamped with the crackle stamp. 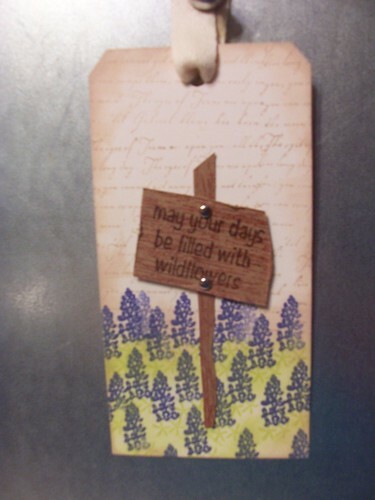 My fourth tag is a scene using some background stamps and a couple large stamps. I saw a card kind of similar to this once but I have no idea where to track it down at. 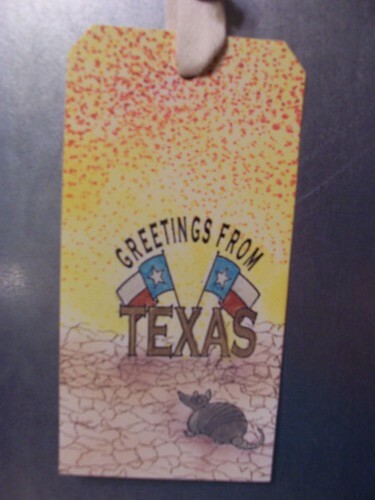 I used the shimmer watercolors to fill in the Greetings from Texas and the Armadillo. My fifth tag is a good ol' blue bonnet tag. 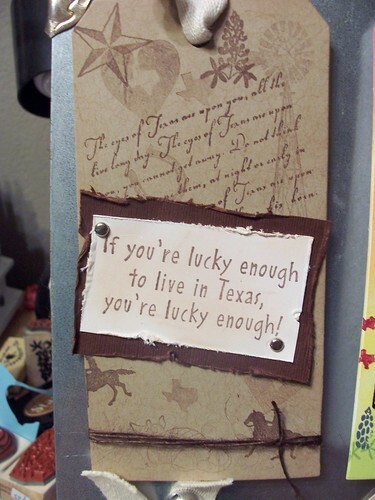 The background has the Texas script stamped and then I created a wooden sign using the weathered wood background stamp. 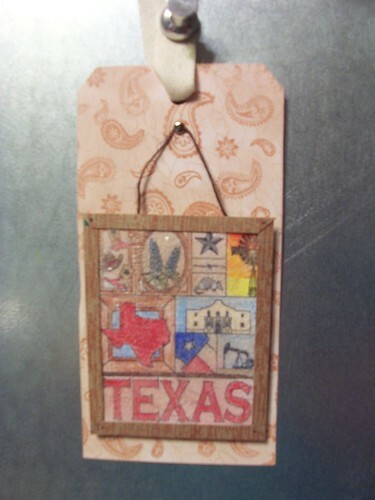 My last tag is the Texas collage. After coloring the image, I covered the entire piece with Rock Candy Distress Paint. It's hard to see in the picture but it gave a cracked glass look so I framed it with some leftovers from the previous tag and then created a background with paisleys and more crackle stamping. Those tags are amazing. Great job. This class will fill up fast. Great job! I'm sure the class will be a hit!